The 5 songs in this incredibly useful volume are “Camptown Races”, “Danny Boy”, “Greensleeves”, “Five Foot Two”, and an original blues tune by the authors, “Lonely Blues”. The perfect book to follow 21 Songs in 6 Days: Learn Ukulele the Easy Way. Get more practice playing five chord songs as you learn new skills to help you sound even better. You’ll learn a total of 9 chords. All 5 songs include: strum patterns, chord diagrams, musical and tab notation, and lyrics. No matter what your preferred learning style, the authors have you covered. How to read and play tab and fingerpick melodies step-by-step. How to strum the ukulele: Discover the 3 strumming patterns all others are based on. Learn to combine them into fancier patterns that you can use to make all your music sound great! Beginning blues improvisation… discover the fun of making your own blues melodies. Failure is not an option! You’ll overcome any obstacle with clearly articulated troubleshooting tips distilled from the authors’ decades of music teaching experience. Plus a brief history of each song, a chord glossary with chord symbols and photos, ukulele tuning tips, recommended reading, and more. No matter how you play today, you’re about to enter a new dimension of ukulele proficiency. You’ll discover a deeper level of pleasure and enjoyment every time you pick up your ukulele to play. Prepare to be showered with generous praise. 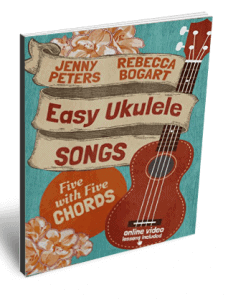 Grab your copy of “Easy Ukulele Songs: 5 with 5 Chords” now.